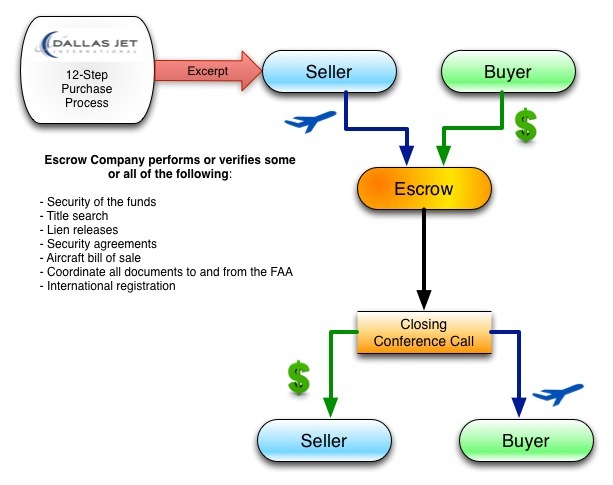 One commonly misunderstood point in the aircraft sale (or purchase) process is the escrow process. The role of the escrow company is to act as a neutral third party in the transaction. The following diagram is a simplified overview of the process. Let’s discuss the following chart below of functions the escrow company performs. After the buyer and seller have come to a general agreement and the buyer has submitted a “letter of intent” and the Seller has excepted the LOI, the next step in the process is to “escrow” refundable deposit funds. It is vitally important to have a detailed agreement about the escrow process, (even down to the details of the order in which steps are to occur) so that there are no surprises during the closing. Once the inspection process is complete and all documentation has been processed and verified, the airplane is flown to the agreed-on delivery location. We purchase fuel to formally acknowledge the closing location of the transaction. Then all parties meet via conference call with the escrow representative. A very specific checklist of events is accomplished during the conference call, culminating in the release of the closing documents to the buyer and the release of the funds to the seller. As an example, a representative in the Public Documents room at the FAA will call in to report the filing time was for example 2:35PM Central Time. In one case, we had everything completed, every box was checked, the airplane was “squawk-free” and delivered to Wichita, Kansas for closing, when one item of contention nearly terminated the transaction. The seller declared that would not release the closing documents until the funds had been received. Customarily, the documents are released upon receipt and verification of a FED reference number that indicates that a wire has been sent. It took several tense phone calls to work out a detailed process to release the FAA Bill of Sale upon receipt of a wire transfer federal reference number by the Seller resulting in the Seller authorizing the escrow agent to file the FAA Bill of Sale and other documents necessary for closing. An experienced representative can spot “red flags” early and avoid or prevent expensive, time-consuming problems and errors. An Aircraft Broker who is well-known and trusted by many of the parties in the transaction (inspectors, FAA officers, escrow, insurance and legal professionals, as well as other brokers) has the opportunity to suggest creative solutions to resolve any difficulties that arise. Detailed agreements outline expectations to everyone’s satisfaction so there are no surprises in the process. An experienced escrow professional and a reputable escrow company make the process more comfortable. At DJI, we take our fiduciary responsibility to represent your interests very seriously. We have long-standing, trusted relationships with escrow companies and legal professionals. We understand how to ensure all requirements are met and there are no surprises for any of the parties in the process. 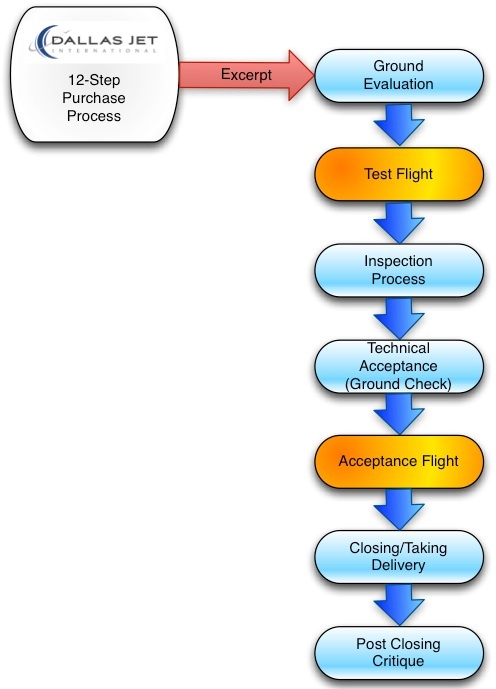 Comments Off on The Purchase Process – Why a Test Flight AND an Acceptance Flight? The aircraft purchase process is necessarily complex. When you’re buying a home or a commercial property, you probably visit the property on more than one occasion, usually accompanied by different experts that have different perspectives and priorities. For the same reason, DJI includes two flights in the process when we represent a client purchasing an aircraft. Each flight is to achieve different objectives. After we’ve located an aircraft for a client, part of our process includes an evaluation of the aircraft on the ground. If the evaluation meets or exceeds DJI’s standards and the client’s expectations; and if all parties agree to the terms, we fly the aircraft to a reputable inspection facility. During this flight, we test all aircraft systems looking for any abnormal indications. These need to be emphasized in the inspection process. If there are discrepancies noted on the flight, we write them up with the Prebuy inspection facility as incoming discrepancies. We perform a thorough ground check to ensure all inspection items have been resolved before the aircraft is returned to service. Aircraft repair is not always as simple as it appears. Aircraft are composed of many complex systems. Even the most experienced OEM or Service Centers may not be completely sure they have addressed the root cause of a problem (or “squawk”) in the inspection process until it is thoroughly retested. DJI’s process ensures that we have several experts involved in the repair and check process. Of course, there are some items that can only be that tested when the aircraft is in flight. As an example – one of the items on the inspection “squawk list” may be that the flaps don’t function properly. The mechanic discovers and fixes a problem with the flap synchronization switch. Now the flaps are functioning properly on the ground. However, when you go on the acceptance flight, the airflow inflight causes the problem to re-occur and therefore additional adjustments need to be made. In addition, an inspection list may include a number of “squawks” that could be interrelated. Repairing or replacing one item may solve more than one problem, or it may have a different cause. We prefer to have different pilots fly the aircraft on the Acceptance Flight. We typically will look for test pilots that have worked for the Manufacturer of the Aircraft and use them when able. Why not use the same flight crew? Pilots process a huge amount of information when they operate an aircraft. Experienced and attentive pilots tend to “learn” the personality of a particular aircraft and may become comfortable with idiosyncratic behavior, even after a single flight. Anything that has been experienced more than once seems more “normal” and less noteworthy. Different pilots bring a fresh perspective to the aircraft, and are more likely to notice and report the anomaly. Upon successful completion of the acceptance flight, DJI is more comfortable stating that all of the inspection items have been resolved and the transaction can proceed to closing. The acceptance flight can also deliver the aircraft to a location convenient for the client to close and take delivery of the aircraft. We work with our clients carefully to determine the best location for delivery, and we always purchase fuel at that location and add the receipt to the closing documentation package for the aircraft. DJI takes our fiduciary responsibility very seriously. This process, including two flights with different flight crews, is the best solution for ensuring that each transaction is successful. 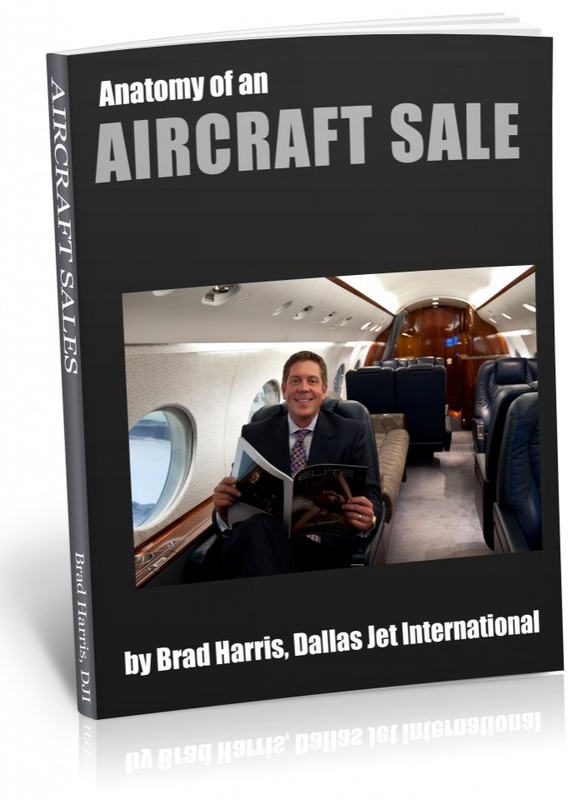 You are currently browsing the Aircraft Sales Insights blog archives for March, 2014.